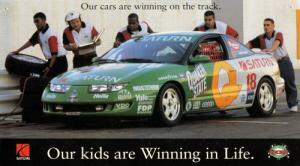 Many years ago, Saturn Corporation participated in the Sports Car Club of America racing series. Dave Rosenblum, who ran the Inner City Youth (ICY) Racing Team, ran and managed the team that raced Saturn S-Series coupes, like the modified SC2 you see above. They not only raced, but they won – including the SCCA's World Challenge T2 Manufacturers' Cup. Read more about their efforts – and successes – in an excerpt from a promotional card that Saturn handed out at autoshows in the late 1990s. The Saturn Inner City Youth Racing Team took home the SCCA's World Challenge T2 Manufacturers' Cup, earning more points than team like Honda, Acura, and BMW. We're especially proud of this award because it says a lot about our cars and our company. Our cars are fun to drive. Torque-heavy tuning, sequential-port fuel injection, true MacPherson-strut front end and optimized tri-link rear suspension give Saturns surprising performance. Our company believes in the strength of teamwork. We've been sponsoring the Inner City Youth Racing Team since 1991. Dave Rosenblum, a recovering substance abuser, started the team in 1984 with a vision of keeping kids in school and out of trouble. Since then, more than 85 kids have gone through the program. There are currently 2 users and 290 guests online.